Brewing with dark specialty grains is essential to develop roasty flavors and aromas and achieve various colors, but working with dark grains can also result in unfavorable harsh flavors. Sometimes confused with hop bitterness, the burnt and acrid components derived from mashing dark grains usually occur due to prolonged periods of contact with hot water. It is common practice to throw all the grains for a recipe into the mash. 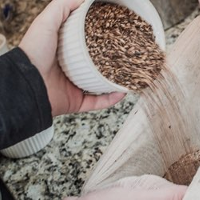 This is usually fine, but dark grains like black malt or roasted barley do not need to undergo conversion for brewing—this is why extract brewers can use specialty grains. Not every grain reacts the same while being processed for brewing. Two grains of the same color may not necessarily benefit from a cold or hot steep. Start by taking a day to experiment with the grains you will be dealing with. 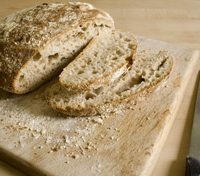 Try soaking the grain in question in room temperature water and at steep temperatures for 5 and 60 minutes. You may be surprised by what you prefer! During the kilning process maltsters conduct to produce darker grains, high temperatures break down almost all of the proteins and starches in the grain, leaving little to nothing to be converted in a mash. So when adding dark grains to a mash, you are essentially conducting a long, high-temperature steep and not any sort of conversion. Dark grains do help optimize the pH of the mash because of their high acidity, but troublesome mash pH can be altered by other means if needed. Most malted grains come with husks still intact, though a small variety of huskless grains are available. When the husks of dark-roasted grains are included for an entire mash duration, or even just the sparge, the prolonged period of contact with hot water allows for the tannins in the husks to be extracted. In beer, tannins translate to astringency. If you want to get a bit more technical, the unfavorable, harsh components are derived in the mash when complex melanoidins are extracted. The favorable melanoidoins are structurally much simpler and do not necessitate a prolonged hot steep to extract. 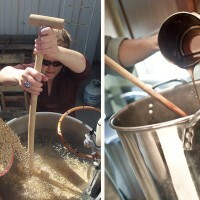 Gruber found that for some dark grains (see side bar), steeping the crushed grains in room temperature water for 24-hours creates an extract that can be added to the boil pot or fermenter. Flavor aside, Gruber noted that the less heat involved in the process, the richer the aromas. 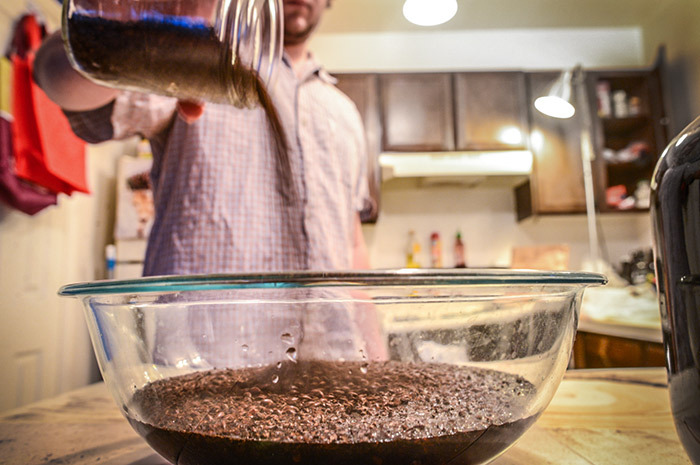 Homebrewers can create a cold-steeped extract by soaking 1-pound of crushed grains in 2-quarts of water overnight. After 24 hours, strain the grains and add to the beer as your preference dictates. 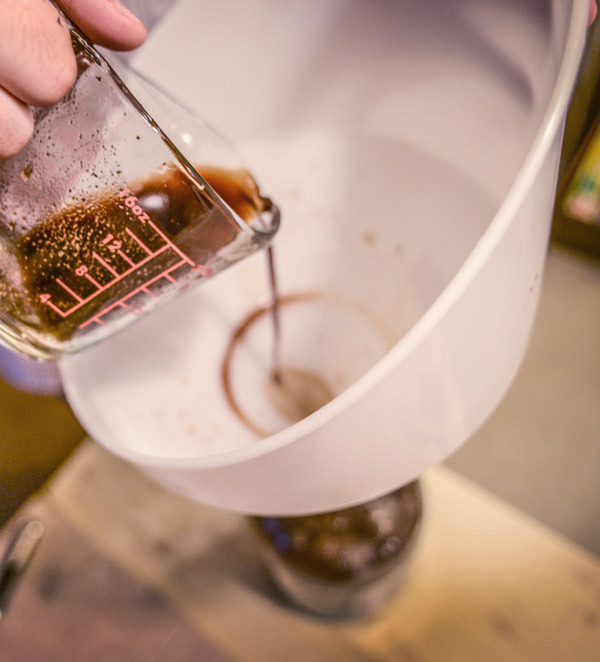 The remaining extract can be heated to 150°F, transferred to a mason jar and refrigerated for up to a month for use in future brews. 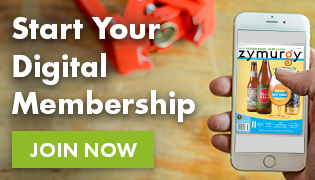 For more information, grab a copy of Brewing Better Beer by Gordon Strong, and members can check out “Cold Water Extraction of Dark Grains” by Mary Anne Gruber (January/February 2002 Zymurgy) instantly using eZymurgy or the mobile app.